A master plan community where people can work, play, live, eat, and shop minutes from home! 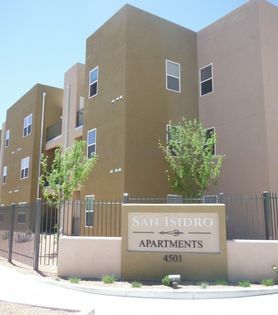 With the addition of this community, we will now have over 1,700 people living in San Isidro Apartments who do not have to get in their car to see a movie, shop for groceries or grab a bite to eat! Everything you need is just steps away from your front door. With 1, 2, and 3 bedroom floor plans, San Isidro is Urban Living at it's Best in Santa Fe! Call today for a personal tour with one of our friendly staff members. Resident Login 4501 San Ignacio Rd.